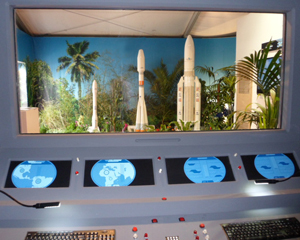 A look into the future of Arianespace’s Ariane 5, Soyuz and Vega launcher family operations from French Guiana is being demonstrated at the company’s Paris Air Show exhibit this week, complete with a control room “feel” and scale models of these three vehicles. The display – located in front of Arianespace’s hospitality chalet at Le Bourget Airport (Row A, Chalet 232) – gives attendees an idea of how the heavy-weight, medium-lift and lightweight launchers will provide capabilities to orbit a full range of spacecraft payloads from the Spaceport. Visitors to the exhibit are given the perspective of being part of Arianespace’s team of 80 professionals that will handle and perform launch operations, as well as manage and maintain the launch facilities in operational conditions for the Ariane 5, Soyuz and Vega trio. Positioned at a simplified control panel, air show attendees look through a window to scale models of Soyuz, Vega and Ariane 5 – which are situated in an environment typical of the Spaceport’s equatorial location. Completing this Paris Air Show exhibit experience is the projection of 3D movies showing an Ariane 5 launch campaign and liftoff, as well as the “dry run” mission rehearsal held earlier this year for Soyuz.